Collecting ads since 1973, using Windows 8.1, I have created my own CD with only the actual hand drawn ads of the trucks. I really like the old hand drawn ads but I stopped collecting ads when photos were used. Print your own Signs - Posters - Prints - Wall Decorations - and more! Spanning the years from 1906 thru 1967. You are not authorized to sell, copy or give away the contents of this CD. Everything is packed onto ONE CD. 559MB! Due to the ease in copying cd's, I do not offer a moneyback guarantee but I will exchange the same CD with a new one should it prove to be defective. Featuring 61 manufacturers of trucks. 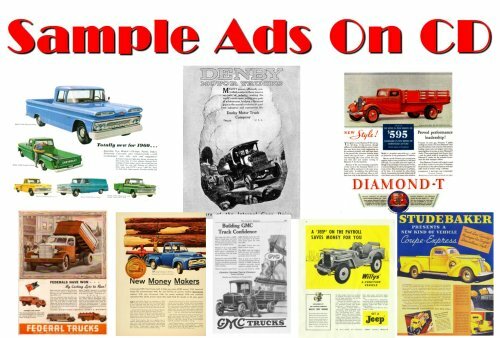 Ads range in years from 1906 thru 1967. Most of the ads here in the website are on the CD. As I originally started scanning my ads in 1996, some ads were old and torn, damaged, etc... Those ads are NOT on the cd, just the full size actual ads. Please note that some images are donations from various collectors. Most of the ads have NOT been edited, cleaned or otherwise ready to use. Sizes vary from 4" up to 18". Image formats are .JPG format. Truck manufacturers listed below with the # of ads per make. All CD's are shipped in a clear plastic slim jewel CD case. Price: $14.95 plus shipping 1st Class Mail. All items are shipped in a bubble envelope. International orders, please allow 8-15 days for delivery. We print our own license plates, wall clocks, signs, stickers, t-shirts and more. Please allow 1-2 days for your order to be processed and as we ship by USPS 1st Class Mail, please allow 2-5 days for shipping time. Signs are created as a tribute only. All of our products are printed by us and not mass produced. No rights are implied or given with respect to the images used. If you have rights to an image weve used, please email us and we will remove the listing immediately.